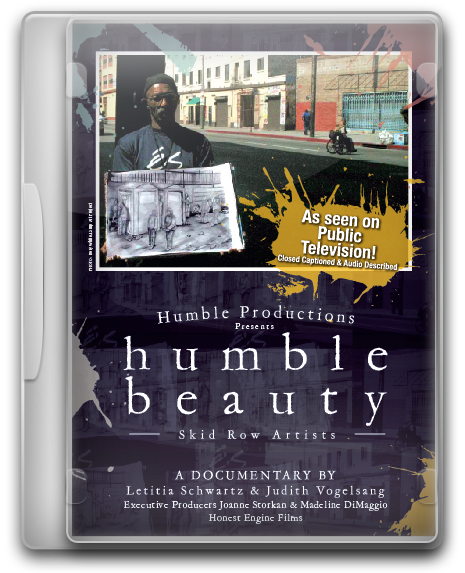 The true story of how making art changed and saved the lives of talented homeless and indigent men and women in downtown Los Angeles, the homeless capital of America. Art is ubiquitous in human life. People will make art no matter how difficult the circumstances. In return, art transforms lives. - See Reviews Below from Library Journal, Video Librarian and more! Our non-profit fiscal sponsor, From the Heart Productions, 1455 Mandalay Beach Road, Oxnard Shores, CA 93035, accepts tax deductible contributions on behalf of HUMBLE BEAUTY. Please write Humble Beauty in the check memo line. We greatly appreciate all donations. Thank you for your support!